I read the e-mail on the morning of September 28th, which was sent out the night before about Bobby Kurtz' passing away, I was shocked. Pat Lindsay's e-mail indicated that he was ill for several months. I felt sad and then ashamed. I had not seen Bobby's familiar face all summer on the East Pond of Jamaica Bay, yet it never dawned on me that something was amiss. Bobby Kurtz at the North End of the East Pond at Jamaica Bay. While I did not bird often with Bobby, the few times I met him in the field, I was endeared by his personality. It might also be that because we shared a love for shorebirds that I was drawn to his charm. Certainly, he was the only birder I knew that could break out in jerking moves that Shai Mitra described as a kind of Rumpelstiltskin dance. All for the sight of a good shorebird or raptor. For Bobby, that could have "merely" been the sight of a juvenile Least or Semipalmated Sandpiper. I still remember his enthusiastic shout of "Whimbrel, Whimbrel" at Jones Beach Coast Guard Station in 2009 - he was practically foaming at the mouth. I had just started birding and his reaction to that bird that day was infectious. I felt that I wanted to celebrate shorebirds like he did. He loved his shorebirds! But more so, he also loved his raptors! It was interesting to see how torn he became while viewing shorebirds on the East Pond at Jamaica Bay and his response after a Peregrine Falcon came through putting everything up. I would be frustrated but Bobby's reaction would be like a dad scolding a kid (gently). "Well at least, he did not get anything" in a voice more of admiration than admonition. 2012 Bobby Kurtz 3rd from L enjoying the 1st Ruff that I found on the East Pond. I attended Bobby's wake on October 8th and listened to the outpouring of love from many of his friends. Kind, thoughtful, sorrowful words flowed from many. 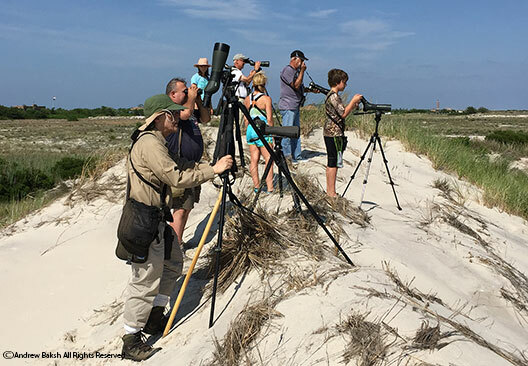 His friends from the Fire Island Hawk Watch talked about his never-ending joy at seeing migrating raptors. Bobby Berlingeri, whom he was close to, had it the toughest I thought, in speaking about their time together. John Askildsen, spoke to us about the secret on why Bobby used two walking sticks. I don't think anyone in that room knew before then. Who knew the solution to probable knee problems due to "deep knee bends" in the Navy would be to use walking sticks to make up for overworked knees. Clever and typical of Bobby. I think Bobby would have approved at all the things everyone had to say. I am sorry I never got a chance to visit Bobby while he was ill. 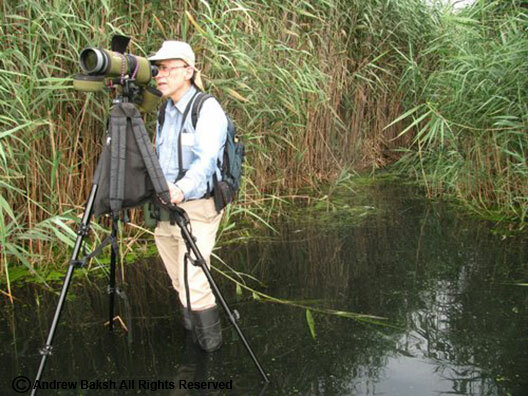 I would have loved to talk birds with him, to share with him the news of a Jamaica Bay West Pond restoration and of the shorebird numbers on the East Pond. Farewell Bobby. A lot of us will miss you. Where ever you are my friend, may your vision and hearing be filled with the sights and sounds of the birds you love as you sip on a Franziskaner Hefeweissbier Dunkel. Rest In Peace! Unless otherwise noted, all of the content is the © of Andrew Baksh 2008-2016 . Click here to see photos from the 2010 Earth Day events.